Is New York City headed for another foreclosure crisis? When Canadian fashion mogul Maurice Benisti’s company lent nearly $19 million to a buyer of a new apartment at Extell Development’s One57, there was no indication that the deal was doomed. But the entity reportedly linked to Sheri Izadpanah failed to pay back the mortgage by its due date of July 8, 2016, and an LLC tied to Benisti put the four-bedroom unit on the auction block in June 2017 — marking the first foreclosure on Billionaires’ Row. The two foreclosures momentarily rocked the real estate world and were seen as warnings of what happens when buyers fly too close to the sun. In the second default at One57, other forces were likely at work: The owner, Nigerian oil tycoon Kolawole Aluko, stopped making payments on his condo while being investigated for alleged money laundering in his country and Europe. While these two cases are largely viewed as anomalies, that perhaps only holds true within the upper echelons of New York’s residential market. From more of a bird’s-eye view, the apartments in One57 were two of 3,306 homes throughout the city scheduled for auction last year — the highest level seen since 2009, according to a January report by PropertyShark. Brooklyn and Queens primarily drove the city’s 58 percent year-over-year increase, with 827 and 1,260 first-time foreclosures, respectively. The high volume of auctions doesn’t necessarily portend another crisis, but there are other signs of potential trouble. Interest rates are on the rise, and with banks held back by regulations, a growing number of alternative lenders — at times, working off of riskier credit lines — are filling in the gaps. Meanwhile, the Trump administration’s long-term plans for financial regulation remain unclear. At the federal level, various consumer protections are at risk, which could shift the market’s current stability, said Jacob Inwald, the director of foreclosure prevention for the nonprofit Legal Services NYC. Compounding outside forces, of course, is the fact that New York is an especially expensive place to live. Sales prices for single-unit and two- to four-unit properties throughout the city last year jumped 11 and 14.2 percent, respectively, the NYU Furman Center’s latest State of New York City’s Housing and Neighborhoods report shows. And the rise in home prices in the city has long outpaced increases in income: 44 percent of owner-occupied households with a mortgage are “housing cost-burdened” under federal guidelines, meaning more than 30 percent of household income is spent on housing costs, according to the report. “Severely cost-burdened” households — those that spend more than 50 percent of their income — made up 22.7 percent of households with mortgages. There are signs that such cost burdens are taking a toll. In the first quarter of 2018, the New York metro area — including the city and parts of New Jersey and Pennsylvania — had the 22nd-highest rate of foreclosures of the 219 areas tracked by property data firm ATTOM Data Solutions. During that three-month period, 920 homes were scheduled for foreclosure for the first time — a 31 percent year-over-year increase, according to PropertyShark. New foreclosures on Staten Island jumped 226 percent to 189, compared to 58 in the first quarter of 2017, according to the report. Brooklyn experienced a 64 percent year-over-year increase with 275. The Bronx followed with 117 scheduled foreclosures — a 33 percent increase — and Queens had 303, representing a 13 percent decrease year over year. Manhattan only logged 38. Caroline Nagy, deputy director of policy and research at the Center for NYC Neighborhoods, noted that while banks have pulled back on originating riskier loans, they are more eager to foreclose on homes as property values rise. Home flipping — buying and selling a property within a 12-month period — is on the rise. Of the roughly 1,026 homes that were flipped in the five boroughs in 2017, 34 percent had been seized from their original owners, according to an April report by the Center for NYC Neighborhoods. Such was the case with 15 Martense Court, a two-story townhome in Flatbush. Alma Walker had lived there with her late husband since at least 1973, property records show. The octogenarian had a $645,000 reverse mortgage on the property — a type of financing reserved for senior citizens. Reverse mortgages don’t require regular loan payments but must be paid back when the borrower dies or moves. Walker, however, triggered a default by missing property taxes and insurance payments, according to court documents. She received a notice of default from Nationstar Mortgage on July 22, 2015. Based on records, it appears she was able to short-sell the two-story home for $480,000 in April 2016. The following January, the buyer sold the home for $995,000. 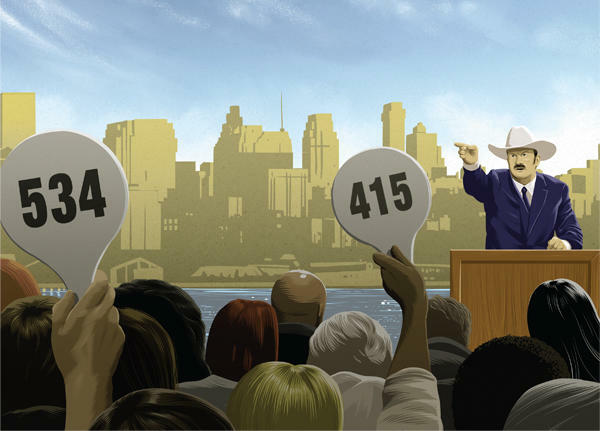 A closer look at these cases also shows that other factors are to blame for the rising number of auctions in New York City. One notable reason is that foreclosure cases take considerable time to resolve — it often takes 18 to 24 months from when a foreclosure is initiated to when an auction is held, and some cases can drag on longer. New York courts are also working more vigorously to clear out their backlogs. An administrative judge in Brooklyn, for example, recently assigned four civil judges to handle the cases in order to adjudicate them more swiftly. 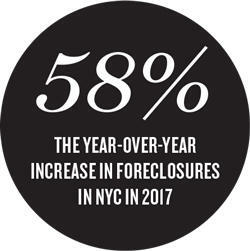 And by January, the number of foreclosure cases in Brooklyn hit 6,500, the lowest volume seen in the past decade, according to the New York Law Journal. In May 2017, the state Supreme Court in Brooklyn also moved to quietly dismiss thousands of foreclosure cases filed before Jan. 1, 2016. The number of new foreclosures initiated — through a legal notice known as a lis pendens —dropped 4 percent last year to 12,072, according to PropertyShark. But the number of preforeclosure filings, the first step in the foreclosure process, rose 28.7 percent year over year to 49,494 in the same period, per the Furman Center’s report. Queens and Brooklyn saw the greatest number of prefilings in 2017: 19,223 and 14,730, respectively. Seizing a property, however, isn’t necessarily a lender’s first choice. Due to the lengthy timeline of such cases, they will often opt to find other solutions, said Emil Samman, a partner at the law firm Romer Debbas who represents condo and co-op boards on loan defaults. It is only in cases where banks are confident that they won’t be “taking too much of a haircut” that they’ll go the auction route, he noted. Legal Services’ Inwald also noted that banks are generally hesitant to foreclose; they especially were during the recession years. That’s changed recently, particularly in rapidly gentrifying areas of Brooklyn and Queens such as Jamaica, Canarsie and Flatlands. “There’s more of an incentive in Brooklyn to foreclose because there’s money to be made,” he said. The government has stepped in to some degree to help struggling communities. In April, Gov. Andrew Cuomo signed into law new protections for reverse mortgage borrowers, including requiring lenders to provide a 90-day notice before taking legal action against homeowners. The city’s Department of Housing Preservation and Development announced in February that it took over 38 distressed mortgage notes for one- to four-family homes in the Bronx, Staten Island, Queens and Brooklyn. The acquisitions were done through the city’s Community Restoration Fund, a program that aims to help owners remain in their homes. In cases where homeowners have defaulted on their mortgages, the program offers relocation services and works to keep the property as affordable housing. In 2016, the city took over 24 distressed mortgage notes. Kim Darga, associate HPD commissioner, said the program helps “stabilize communities” during times like this, when property values are rising, there’s increased activity among nonbank lenders and the residual effects of the previous financial crisis are still being felt citywide. “It’s important that we step in,” she said. With tightened regulations following the 2008 financial crisis — and more oversight than ever before — banks have been forced to employ more conservative lending practices. Many stopped lending to borrowers with credit scores below 640 (generally considered subprime) and started requiring heftier down payments. Yet a decade after the last market crash, banks are still finding new ways to profit from the root cause of the crisis: subprime loans. These days, rather than lend to underqualified borrowers directly, big banks — including Wells Fargo and Citigroup — reportedly provide private mortgage shops with short-term warehouse lines of credit. Those nonbank lenders, in turn, tend to fund loans to riskier borrowers with higher debt-to-income ratios, according to a paper released by the Brookings Institute in March. From 2010 to 2017, large commercial banks provided $345 billion to those alternative lenders, the Wall Street Journal reported in April. Compared to traditional banks, private equity firms, hedge funds and even online mortgage providers are bound by fewer postrecession regulations like the Dodd-Frank Act and the Basel III accord. And those alternative lenders have gained significant market share: They originated nearly half of all residential mortgages in the U.S. in 2016, up from 30 percent in 2012, according to the Brookings paper. The report, authored by researchers from the Federal Reserve Board and the University of California, Berkeley, warns that the growing dominance of nonbank lenders could result in “liquidity vulnerabilities” even greater than in the lead-in to the last financial crisis. But Quicken Loans Vice Chair Bill Emerson, among others, took issue with the report. Quicken Loans — which originated $715 million in loans New York City in 2017 and was the third largest home loan originator in the city last year, according to ATTOM —is one of several private firms that have been accused of recklessly issuing Federal Housing Administration-secured loans and cashing in when borrowers default. The Detroit-based company has been fighting the U.S. Department of Justice over the claim since 2015. Nonbanks can issue loans that follow FHA guidelines, which require borrowers to meet certain financial thresholds. The federal agency then insures the loan so that in case the borrower defaults, the lender is paid back by the government. But there is increasing concern within the agency that if too many mortgages go bad, the FHA will be weakened and unable to pay a rising tide of claims in another downturn, according to a recent Bloomberg report. Meanwhile, rising interest rates give further cause for concern. In May, the average rate for a 30-year fixed-rate loan reached 4.6 percent — its highest level in seven years, according to Freddie Mac. Rates have gradually increased over the past year following a sustained decline in 2016, when the average fell to 3.42, according to the Wall Street Journal. As a result, refinancings are on the decline. In May, the share of mortgage applications that were refinancings fell to 35.3 percent, the lowest level seen since 2008, according to the Mortgage Bankers Association. Roughly half of the loans originated by nonbanks in 2016 were for refinancing existing mortgages, per the Brookings report. Still, Wells Fargo’s Eric Gotsch said he didn’t think the rise in interest rates would dramatically impact his company’s business. It might mean buyers are spending more on monthly mortgage payments and turning to lenders who are willing to stomach a higher debt-to-income ratio. Citibank expands market share cautiously, he said. Though the bank doesn’t see subprime loans as a viable core business, he said he can see why others might be going that route: to recapture market share as interest rates rise. While President Donald Trump promised to “do a big number” on the Dodd-Frank Act in January 2017, the reform bill Congress approved in May rolls back some regulations that apply to smaller banks and credit unions with under $250 billion in assets but leaves oversight of major financial institutions largely intact. What’s more concerning, industry sources say, are the implications of the new GOP tax legislation. Some, including Cuomo, have predicted that the law, which was passed last year, could hurt home prices and lead to more foreclosures since homeowners will inevitably be more cash-strapped. The $10,000 cap on the deductibility of state and local taxes (SALT) and the cap on mortgage deductions are expected to hit homeowners particularly hard. That especially holds true in New York, where the average SALT deductions have hovered above $20,000 in recent years. Real estate appraiser Jonathan Miller said lenders are paying careful attention to the creditworthiness of borrowers, unlike in the lead-up to the housing crisis, “where you just had to have a pulse.” He said the fact that foreclosure auctions are up even after ramping up regulations should give some pause. Marc Wieder, a partner at the accounting firm Anchin, said the added strain on homeowners will also likely impact developers. While some are already shying away from new ultraluxury condo projects, they may also become wary of the entry-level market as buyers push the limits of their finances. 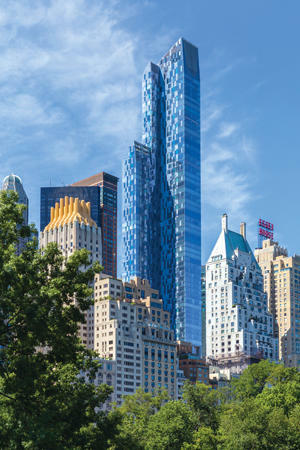 Though foreclosures at high-end properties like One57 are likely one-offs, those instances still show the softness of the for-sale market, said Jeff Greene, the billionaire developer who made a fortune shorting subprime mortgages before the recession. At the June 14 auction, the highest bidder for the condo on the 56th floor of One57 turned out to be the lender, Benisti. Meanwhile, Aluko’s penthouse sold at auction in November for $36 million after a few price chops. At the same time, owners of higher-end properties in New York are finding that their investments aren’t worth as much as they had anticipated. “I’m meeting with a lot of sellers right now who are like, ‘Look, I paid X amount, how can you tell me that it’s worth less?’” said Douglas Elliman broker Frances Katzen. The stakes, of course, are very different for someone taking a $2 million loss on a $10 million apartment and a homeowner who can’t afford to pay off a $200,000 mortgage.